I thought that I would use it on a table-top lathe, but still it was not quick because of rotation. I attached a hand reamer to the tool to turn by hand by hand, pressed the material with pliers, and the hole and the size came out neatly. This review is about item#09513822. Very easy to use, I definitely want things three times this length. This review is about item#9513865. Although it is straight, entering is good, but I am thankful that the scrap loss is a little better. This review is about item#9513813. There is no problem with sharpness. I thought it would be better if there was a mark of monotaro in case in case of own brand. This review is about item#09513831. There is no particular problem in use. I would like to commercialize it in increments of 0.1 mm. This review is about item#9513856. I felt sweet accuracy in my own use. 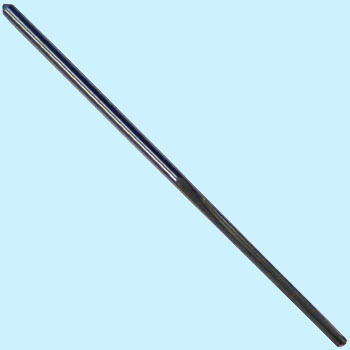 The tolerance of the diameter is bigger than that of other companies' reamers. I'd like to purchase and check the maker's items. I think that sharpness does not matter. This review is about item#9513795. It is inexpensive, well-equipped, and purchased each time as a repeat item. This review is about item#9513831. There was no problem to open the 30 mm square hole like a spacer like a spacer of SUS 304. I thought that stainless steel is impossible because it is just a high-speed steel handler, but I could finish drilling cleanly. Rotational speed control and cutting oil are essential. With a typical drill less than 4.0 mm, the place with the drill bit is easy to bend, but the hand swimmer did not bend without distortion. Example: After inserting a 2.8 mm through hole, inserting a 2.8 mm round bar inserted only halfway, but if you adjust the through hole with 3.0 mm hand mover, high speed steel 3.0 mm for lathes will run out It entered. The first was that only 3.0 mm of high speed steel for lathes was inserted halfway even when a through hole of 3.0 mm was drilled only with a drill. After arranging the through hole with HANDREMER 3.0 mm, high speed steel was inserted but the play was over 0.1 mm and the wobble became terrible. To MonotaRo I would like to cooperate with the FP tool and sell handlers or machine reamers in increments of 0.1 mm. Since the cutting hole is not distorted, I also want to open a pilot hole with a reamer. This review is about item#09513804. I had low expectations at a low price, but I am satisfied with the taste much more than expected. I am glad if there is something a little working diameter now. This review is about item#09513795. To make collet chuck for router · milling machine. Although I purchased HR 2.0, HR 3.0, HR 4.0 and still uses only HR 4.0, I feel that it was good to have 4 blades up to the blade diameter Φ 4.0 mm. I opened the pilot hole neatly and used HR 4.0, but the chips are not discharged cleanly. (Processing hole 3.8 mm · hole depth 20 mm · Material: iron and blade length is 40 mm so I think that it is normal that there is no problem even if the hole depth is 20 mm.) Also, "Length with eating (mm) 1 (± 0.3) ", but it was only 0.5 mm (± 0.05) in the digital calipers measured. In fact, if the eating length is 1 mm: 45 degrees, in principle it should be fine for 2.1 to 3.9 mm pilot holes, but for 0.5 mm: 45 degrees it will be 3.1 to 3.9 mm. Of course the eating hat of HR 2.0 · HR 3.0 was also different. In the local home center, the blade diameter of single item · Nazi · titanium coated drill was 3.8 mm. (3.9 mm is different in series, the amount of money is high.It is nearly doubled by the order.) And because the case is the same as HR 2.0 · HR 3.0, the longest HR 4.0 that I bought is the case length If you reduce it the most, it will not fit in the case. The case shape uses the same shape as the Nazi / Drill, and we deal with a long case that will hold HR 4.0 well. Since there is a thing that remains, I change the case and change the label sticker. It is also true with MonotaRO's long neck end mill, but I'd like you to refrain from cases where the case is shorter. HANDREMER had no rubber blade blade cover attached. I think that it is paper for rust prevention, but it is thin at blade diameter 2, 3, 4 mm, so even if the roll of paper was carefully peeled off, it could not be peeled off cleanly and the end mill was 4.0 or less in shank size 4.0 mm Since it has only the blade tip cover for mm, if the shank size is 3.0 mm or so, the cover may be disconnected inside the case. Because it can not be used, I bought a drill blade cover at the local home center and it is attached. I would like you to adopt the case of Nazi and Nisshin Tool in reference. This review is about item#09513813. This review is about item#09513847. Although brown spots can be seen with dots on the rake face when looking at product pictures, rusting has occurred as shown in the photo. It seems that removal of iron powder during processing is insufficient to induce rust. Since there is no effect on the cutting edge, I think that there is no choice if I consider the price. Since I have not used it yet, the satisfaction level is 3. I am planning to use it for the hole of SUS 304. When I measured it with a caliper, the tip of the reamer was 7.9 mm. Probably because it is used only once, it was decisive of purchase that it was cheap in price But just how strong it is? I do not understand without trying it. Although the price is cheap, it is out of the way unexpectedly and it is useful. Processing was done without problems. However, because there is no taper at the tip bite portion, rattles are attached to the entrance part of the hole, but I think that it is a good product when considering cost performance. This review is about item#09513856. usually. It is not possible and it can be used. It is labeled properly in the reamer storage case, it is very convenient at the time of selection, it is designed to be very easy to use, it can be said that there is no problem in accuracy and workability.